I love tuna and Alexander loves tuna melts. In Luang Phabang, at E’Stranger Literary Salon, I wanted to try a chili tuna burger, but they were all out of chili tuna patties. At JoMa in Vientiane, Alexander had a truly decadent tuna melt. It came on two separate slices of whole wheat bread with a chunky layer of tuna salad on each, topped off with thick slices of melted cheddar. 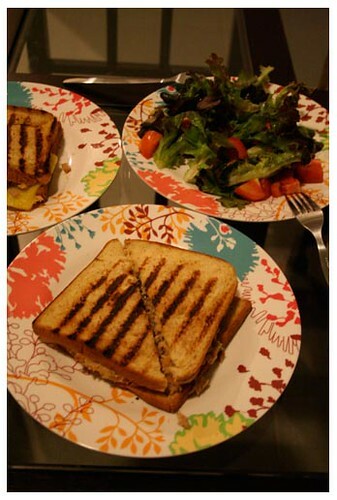 His love of tuna melts and my desire to have a chili tuna burger inspired me to create a chili tuna patty. Crush the chili, garlic, and spring onion together. Add the soy sauce and lime juice and combine well into a rough paste. 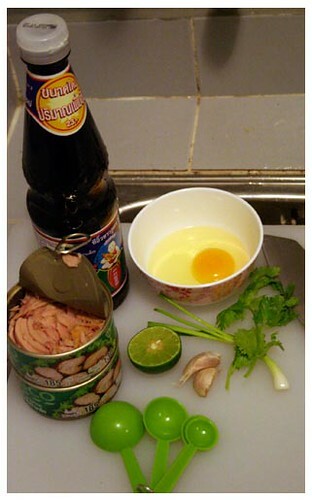 Empty the tuna chunks into a mixing bowl, add the paste and combine all the ingredients. When everything is mixed thoroughly, add the egg and blend it into the mixture. Now, shape this mixture into four patties about ½ an inch thick. Heat a pan, lightly covered with some cooking spray over a medium high heat and gently cook the patties until, you basically just want to cook the egg and heat up the patties. 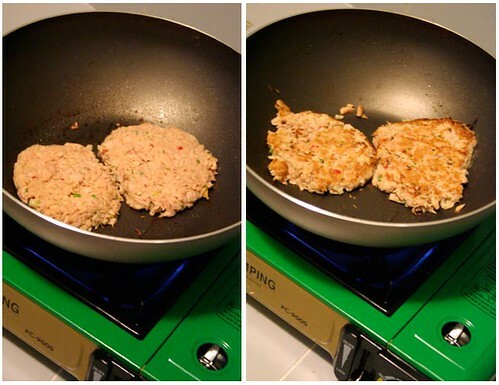 When the patties are cooked, arrange them and some of the cheese between two slices of bread, almost like a double tuna cheese melt. We do not have an oven yet, so I heated up the griddle pan, quickly toasted the sandwiches in the pan and the chili tuna melts were ready. – if you do not like spicy food, make sure you seed the chili before chopping it up.